Update: This giveaway is now closed. Congratulations to Jenny of Creative Cooking Gluten Free! I’ll be in touch, Jenny. Thanks to all who entered! There may be other similar giveaways in the future, so stay tuned. And hopefully, my readers can still glean much on living gluten free easily from my posts here at gfe. Don’t forget I’m only an email away if you have specific questions. It’s almost the final week of my birth-month, as in the full month from my birthday on, not the actual calendar month that my birthday falls in. My girlfriends and I haven’t been able to have our birthday get together yet, but serendipitously I ended up visiting one of my dear girlfriends and her husband on Friday afternoon. I was headed home from a doctor’s appointment and visiting Son when traffic slowed to a crawl on the interstate. I got off at the very next exit, but that took quite some time. However, many other folks had the same idea to detour to the parallel non-interstate, but still four-lane road to continue on. So, in just a few minutes, traffic on it was also backed up and creeping along. Did I mention my air conditioning is not working in my car? Soon, I decided I needed a break. I happened to be about a half mile from my girlfriend’s house, so I popped in to visit “Fred” and her husband, Jack. Fred was actually en route from work, but Jack (who had just returned from being out in the heat all day himself) immediately served me some frosty limeade. It was just what I needed. I thanked him profusely and then we proceeded to chat about all things ice cream until Fred arrived. Jack is an ice cream afficionado who has received some local publicity of late. I’ve mentioned at least one of his incredible flavors before: lemon basil. I’ll be making that one and another amazing flavor of his soon (that one’s will be a secret for a bit). In a short while, Fred arrived and offered me some adult libations. Just looking into their liquor closet is treat enough. Their house was built in the 1920s and the bar is a basically a large closet off the dining room. It’s no ordinary closet though. It has glass shelves and mirrored walls. With the multi-colored glass bottles and decanters in all shapes and sizes, that are full of liqueurs and other alcohol in even more colors, this closet and its contents are a very attractive sight to behold. I consented to one glass of something mild. First, I tasted the Domaine de Canton ginger liqueur that Fred offered … straight. Too strong for me in that form, but as Fred said it would make a great bourbon and ginger drink. Then I tasted Arancello orange liqueur. Think of Limoncello, but the orange version. Oh, yes, much better. Sort of like TruAde orange (a noncarbonated beverage of old) with a tiny kick. I added some to my limeade and enjoyed a very delightful, refreshing drink. We visited for quite a while, catching up on news of Fred’s daughter’s wedding and a visit and travels with friends from Scotland after the wedding. Then Fred gave me my birthday present. A gfe reader, Selene, had recommended Boyajian pure citrus oils a few months back when Alta (Tasty Eats At Home) and I were discussing a lemon version of my Perfect Pound Cake. Selene said that the citrus oils could be used in place or zest or extract, and the lemon oil made an amazing lemon glaze. Intrigued, I quicklylooked on Amazon and added the mini citrus oil set to my wish list. (Do you have an Amazon wish list? You might want to consider it. It’s an easy way for friends and family to shop for you and you’ll get what your heart desires. Plus, it’s a way to remember things you want to get for yourself.) A pretty little package of three of the mini sets wound up in my gift bag from Fred. Selene’s comment and the reviews online show that these citrus oils are terrific to use for baking, and even non-baking uses like cocktails. From what I’ve read, a little goes a long way, too. Stay tuned for my experimentation with them. Also in my package was a red leather envelope (for photos, receipts, or such) and the book, The Four Agreements (also from my Amazon wish list). It was a delightful gift package. And, all in all, and not surprisingly, we had a very enjoyable visit. Another girlfriend had my birthday present, a personalized canvas tote bag, shipped to me. It’s one of the loveliest, yet practical, gifts that I’ve ever received. I am truly blessed with many amazing friends! Oh, how Mir’s statement totally made my day, my week, my month! I’m sharing it because it got me thinking about how many folks are still sulking in corner or thinking being gluten free is possibly the worst thing that has ever happened to them. Do you want to get excited? Let me show you how. I think this task can actually be fairly easy, but it takes a different approach—the gfe approach– and one’s strategies and meal planning needs to be talked out. What are you eating that’s already gluten free? What dishes do you make that can be converted easily to gluten free? Which gluten-free specialty foods do you really need to buy from day one? And, so forth and so on. So this giveaway is a consultation with me via telephone (I will call you “on my dime” at a mutually agreed upon time) or via Skype, face to face for a more personal session. I’m envisioning about an hour to 90 minutes for this consultation and maybe an email or two as follow up. I expect that folks who are new to gluten free or folks who are still struggling with being gluten free or transitioning to living gluten free easily will be the ones who will be most interested in this giveaway. Many of my gfe readers have already figured out this approach (congrats to all of you!) and will not need this consultation; I understand that. In addition, if you are one who wants to purchase a lot of gluten-free specialty products and are looking for input on those, I honestly can’t help you much there. My gfe approach is about eating real food that’s naturally gluten free, some mainstream processed foods that are gluten free, and few (very few) gluten-free specialty products. The gfe approach is the easiest, healthiest, and most economical way to eat gluten free, in my opinion. That said, based on reader comments, Facebook comments, and tweets, there are many folks who may be interested in this gfe-unique giveaway. I am excited about it! I can’t wait to talk to the lucky winner and making living gluten free easier using the gfe approach tailored to his/her needs. The giveaway will end Sunday, August 15, at midnight my time (Eastern). Here are the ways you can enter below. A separate comment is required for each to get a separate entry. I’m not trying to be annoying; that’s simply the only way I can tally all the comments to enter them into the Random Number Generator. Note that if you already follow me on Twitter, like gfe on Facebook, etc., just say so for another entry. You don’t have to be new to any of those for your entry to count. 1. Leave a comment; e.g., Please enter me in this giveaway. 2. Follow me on Twitter; e.g., I follow you on Twitter. 3. Like gfe on Facebook; e.g., I like gfe on Facebook. 4. Friend me on Facebook; e.g., I am your friend on Facebook. 5. Tweet about the giveaway; e.g., Shirley is giving away a consultation on living gfe! 6. Post on Facebook on the giveaway. 7. 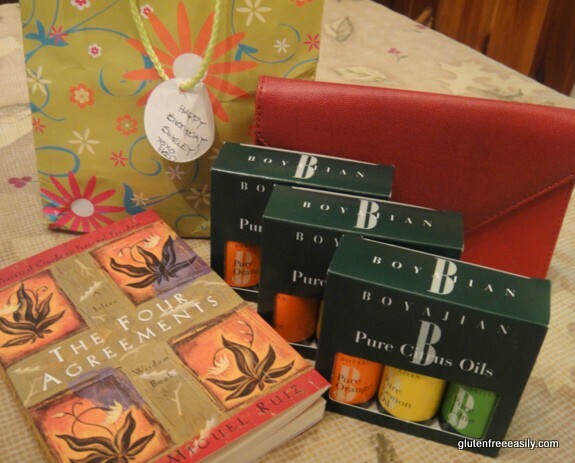 Post on your blog about the giveaway. Hi Shirley, you a gift to all of us that have gluten issues. I am always telling folks to check out your web site for information they can trust and use. Thanks for all you do for others, I am so grateful! Please enter me in this give away. I love the idea! Thank you for being willing to share your knowledge! 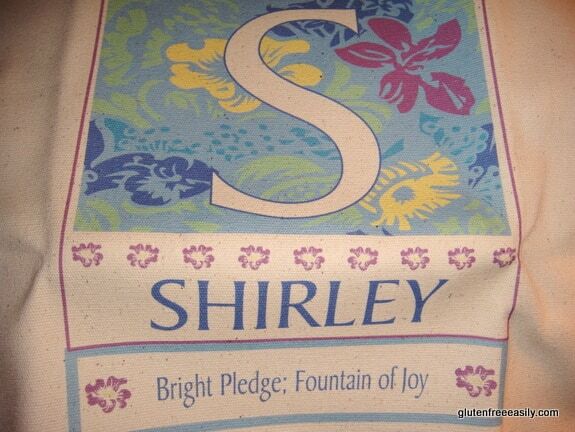 Hi Shirley, I love your blog. I call my celiac diet “adventures in eating”. Shirley, while I’m not new to the gfe approach, I congratulate you on this giveaway idea! Whoever wins this – you’re in for a treat! Hi Alta–Yep, you have the gfe approach down for sure! 🙂 Thanks so much for the very kind words … sure hope we get some more entries! While I’ve been gluten free for about a year, it’s been pricey, and not exactly easy for me. I just stumbled upon your blog so I’m going to go surf through it for tips later on! Hi Anaquita–Welcome to gfe! 🙂 I’m so glad you found my blog. Please enjoy your look around and best of luck on the giveaway. 😉 And, if there’s anything more specific you are struggling with, please leave a comment/shoot me an email. I think it is great you are doing this. Could you just take me by the hand to the food store? I love to cook; I just can’t get myself to the natural food store. Although, the next time I am at the “big” Publix I will check out what “gluten free flour” is carried. Love your site and you too! p.s. Good luck on the giveaway! Hi, Shirley – I don’t know if I qualify since I won the POM a few months ago. But I did post about the $100 off on the CeliacID test. And I got my results back. Hoo-boy. But, and this is something you may have never considered, and that is, what if your spouse thinks it’s a “bunchacrap”? Yeah, yeah, yeah, you’re on a diet, but they’re incapable of or unwilling to “go along with the plan”? And yes, at the moment, getting rid of the spouse along with the gluten is not an option. Hi PattyBoots/Dena–Of course, you are eligible! Winning one giveaway does not make you ineligible for another; it just means you are lucky. 😉 And, thanks for all you share with us here and on the gfe Facebook page!! I have another post coming up on MyCeliacID soon … maybe you’ll tell us more on your results then. Oh, I’ve considered the spouse/family member disbelief/disrespect for sure. I am so blessed that Mr. GFE is super supportive, but he has seen how going gluten free made a HUGE difference for me. another, important factor is one the gfe approach brings, all the food tastes great and everyone wants to eat it. One important thing to do is not even to note that it’s gluten free, just make good food. If hubby wants his roll on the side, fine. I know I’m oversimplifying here, but if you are the head cook, you’re cooking great meals that just happen to be gluten free. It’s not debatable and it’s not a big deal. Flourless, crustless, etc. all make the meals full of ingredients that taste wonderful. If hubby wants to make a sandwich for lunch, that’s okay, too. You just learn a way that keeps everyone happy. But, to be clear, hubby will have to learn that this is real and be careful and accommodating, but there is room for flexibility on both sides. Does that make sense? Sounds like I should do a post on this topic … it can be a big can of worms for sure. I love those citrus oils. I use them all the time. I can’t wait to see what you come up with! No need to enter me in the contest. It would be lovely to talk with you, but thanks to your blog and others we are celebrating 1 year gluten free and LOVING it! The learning curve was steep at first and I’m sure that you will be able to really help someone out. Thanks, christina! Just tried the citrus oils for the first time yesterday. Have a post coming, but it will have to wait until I get back from the mtns it seems. Ran out of time! Such a great post and I love your site 🙂 Thanks for sharing with all of us. I would like to enter the giveaway, am 4 years GF but constantly learning and widening my palate. 4 years gf–woohoo! Yes, we can all keep learning. Best of luck and merci beaucoup for the BD wishes! 🙂 And, welcome to gfe, too! That sounds like a fun and fantastic way to give a birthday present for others. And happy birthday! Thank you so much for the e-mail! I look forward to our consultation 🙂 I will send you an e-mail either tonight or tomorrow and I would love to do a skype consultation with you this week.